Trellis fencing is ideal for all climbing plants, flowers and vegetables. Wooden garden trellis has durable stained timber with rust proof aluminium rivets for long life. Easy to use and erect as wall trellis. Made from sturdy 8mm thick sections with a mesh size of 5.5 inches. Heavy duty trellis fencing is ideal for all climbing plants, flowers and vegetables. Natural bamboo garden trellis ideal for all climbing plants. Suits all gardens, ideal for wall trellis. This white garden trellis is made from white PVC. These white pvc trellis are ideal for all climbing plants. Size : 1.0m (3' 3") x 1.0m (3' 3"). Size : 2.0m (6' 6") x 0.5m (1' 6"). Size : 2.0m (6' 6") x 1.0m (3' 3"). This green garden trellis is made from white PVC. These green pvc trellis are ideal for all climbing plants. Use as wall trellis in all gardens. Easy to use trellis made from natural willow. Ideal for long stemmed plants and climbing plants. 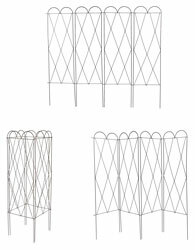 Willow garden trellis available in four sizes. A unique black metal spiral garden trellis that we will suit all gardens modern and traditional. Supplied with wall brackets for mounting. This trellis fencing is ideal for all climbing plants. Black plastic coated metal wall trellis for longer lasting looks. Please look at our large range of wrought iron trellis, willow trellis, trellis fence and trellis planters. Buy British - reduce your carbon footprint. 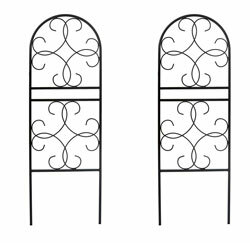 This black metal garden trellis has a traditional scrolled design. This garden trellis is perfect for use in a large container. The decorative trellis has welded rings for fixing. The garden trellis is manufactured from strong durable steel and powder coated. The metal trellis measures 1.65m (64"). This metal wall trellis is of contemporary design. The metal garden trellis has welded rings for fixing. The decorative trellis is made of durable steel and powder coated for longer life. The wall trellis measures: 1.65m (64"). 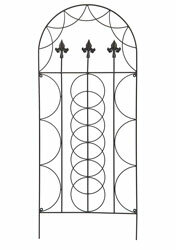 This gothic metal trellis is an attractive modern design ideal for any garden trellis. The wall trellis is easy to fit using screw lugs that are provided. The metal garden trellis has coated steel for long life. Ideal for all climbing plants in your garden. 1.2m (4') x 0.7m (2'3"). This metal trellis is ideal for use in the larger plant container. This garden trellis has spiked feet for secure fixing. Made from coated steel for extra durabitity. This wall trellis has a nature looking leaf design. Size: 1.8 metres High x 0.6 metre Wide. 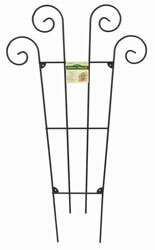 This metal trellis is ideal for use in the larger plant container or on garden walls. This garden trellis has spiked feet for secure fixing. Made from coated steel for extra durabitity. This wall trellis has a nature looking design. Size: 1.3 metres High x 0.4 metre Wide. These garden trellisess are made from powder coated steel and will add an extra touch of elegance and design to your garden. 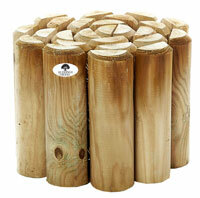 Ideal for use with large stemmed climbing plants. Leaf design. Size: 1.2 metres High x 0.5 metre Wide. These garden trellisess are made from powder coated steel and will add an extra touch of elegance and design to your garden. 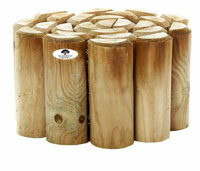 Ideal for use with large stemmed climbing plants. Fleur de Lys Design. This attractive design of metal garden trellis is powder coated for extra durabilty. The eye catching barley twist finials combines style with durabilty. This wall trellis is not only suitable as wall trellis but for use in garden borders, as a garden screen or a fence panel. 1.83m (6') x 0.61m (2'). This Loire Trellis is a decorative wall trellis with scrolled design finish. 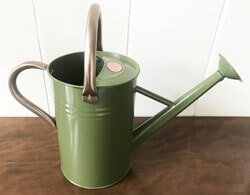 These metal garden plant suppports have a White - Grey Wash finish. This wall plant support has spiked feet for fixing into the ground. Size: 1.5 metres high x 0.4 metre wide. This Versailles Trellis is a tradtional bronze finish. 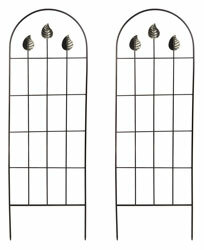 These garden trellises have a Bronze finish. This wall plant support has spiked feet for fixing into the ground. This Nature Trellis is a attractive look with cast iron finish. This wall plant support has spiked feet for fixing into the ground. Size: 1.6 metres high x 0.4 metre wide. Size: 1.5 metres (59") high x 0.4 metre (16") wide. 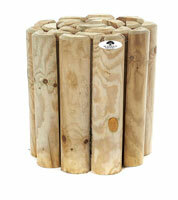 We also have for sale the matching English Rose obelisk in this range. This attractive metal garden trellis is in an attractive modern design. It is easy to fit using the screw lugs provided. The wall trellis is manufactured from coated steel for long life. This decorative trellis is ideal for all climbing plants. 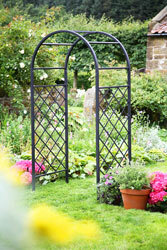 This black metal garden trellis is ideal to screen ugly down and drain pipes. 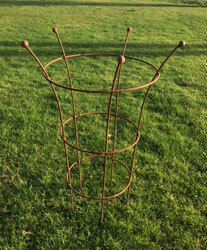 This tube trellis is a set of two pieces and can be used one on top of the other. 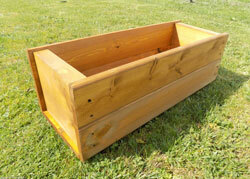 The decorative trellis can be used in conjunction with flower tubs and flower planters. Fixing lugs are provided with this metal trellis. 91cm (3') x 20cm (8"). A unique black metal garden trellis obelisk that we will suit all gardens modern and traditional. Decorative trellis with ball finial. Folds away for easy storage when not in use. Black plastic coated metal three sided trellis for longer lasting looks. Size 1.75m (70") in height. 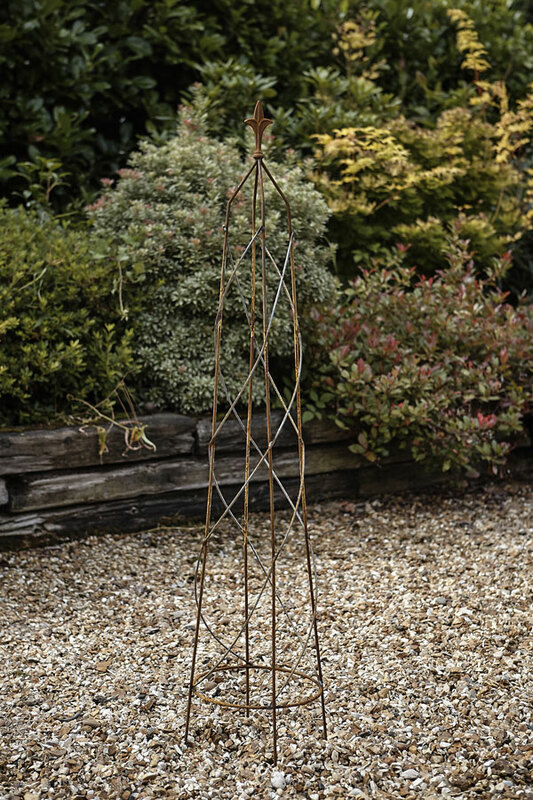 This three sided obelisk makes a stunning feature in any sized garden - modern or traditional. This metal garden trellis is manufactured from heavy duty steel and powder coated for long life. Ideal trellis for all climbing plants. Made from square sections with a decorative spiral designed top. Three sided obelisk measuring 1.35m (54"). 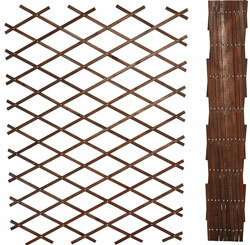 This attractive decorative garden trellis panel can be used a plant trellis, a garden screen or a garden fence panel. 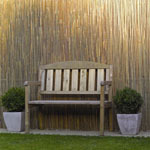 The striking willow constructed garden screening will enhance any home or garden. The trellis screen can be used with many climbing plants as plant support. 1.8m (6ft) x 0.9m (3ft). This fence panel is made from metal construction with natural fern screen woven. These fence panels offer a contemporary metal wavd design. 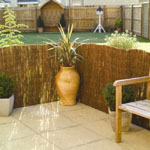 This panel screening is ideal for use as fence panels and garden screening. Size: 1.8 metres high x 0.9 metre wide. (6' x 3'). These trellis fixing kits fixes trellis to walls and also spaces the trellis from the wall. Spaces garden trellis from the wall. Click on image to see our large selection of plant support stakes.